Water chemistry is one of the most important engines of the aquarium. Water chemistry governs every factor within the aquarium directly effects the health of fish and aquatic plants. Water from the tap can often have a water chemistry that makes it unfit for direct use in the aquarium. In these cases it may need to be adjusted to the species of fish or plant in the aquarium. This guide paves the way to easily adjusting your pH, KH, GH and other parameters. PH is the most common area hobbyists have issues or require adjustments. pH is a measurement of the acidity or alkalinity of the aquarium water. 7 is neutral, above this up to 14 is alkaline and below this down to 0 is acidic. All fish species have different preferences and ranges in which they thrive. Few species of fish thrive in completely neutral water. In the wild lakes are often alkaline due to leaching of limestone that lines the base. Rivers such as the amazon are acidic due to leaching from soils and clay beddings. This excess of wood and mud in areas like south America will lower the pH. Drier places with clay grounds and billabongs such as Australia also support a slightly acidic pH. Most fish species will adapt to a range of pH values. It is therefore important to attempt to attain specific values, however over time most species can adjust to small changes. Cichlids are an example of a fish with that require a higher pH. Limestone and coral based rocks are placed in the water as a substrate to create a more alkaline environment with a pH of 8 or higher. Most South American Tetras and Australian rainbows will prefer a lower pH of around 6.5. Changing the Ph can be difficult and needs to be done with cautions. Before changing the pH it is beneficial to think if it is a requirement. Mentioned earlier, fish species will adapt to pH values within a certain range. Attaining specific values can be time consuming and difficult. Aquarium water contains natural buffers to restore the pH to its original value. Liquid pH up and down additives will initially have no effect. This is due to the liquid chemically reacting with the buffers and becoming neutralized. At a certain point the buffers will be run down and the liquid will have an immediate change in the waters pH value. This is dangerous and can cause sharp swings that are toxic to the fish. Try to avoid using liquid pH additives as they are only a short term and unrefined solution. To change the pH you must change the water buffer level. The best way to bring the PH down is to use a commercial plant substrate, add wood to the water and peat to the filter. Peat and wood are great but may initially stain the water a yellow coloration. Powdered commercial buffers also work but they are not an exact science. They will need to be added to each water change to ensure the new water being added is the same pH as that in the aquarium. Raising the pH for housing species such as Cichlids is fairly simple. Substrates such as crushed coral offer a brilliant white substrate and chemically buffer the water to a pH of 8+. Limestone chips can be added to the filter to increase hardness and also boost pH. Ammonia is produced by fish waste and excretion. It can also become noticeable due to excess food and decaying plant matter. Ammonia is toxic to fish and should naturally be removed from the aquarium when it is consumed by biological bacteria in the filter media and substrate. A cycled tank has bacteria that consume the Ammonia and turn it into nitrites which are more toxic but luckily are instantly converted to nitrates which are relatively harmless. If you have any levels of nitrite or ammonia it may be due to a mini-cycle caused by cleaning of the filter medium or a very large water change. It can also be due to over stocking and over feeding. Make sure you are careful to always keep levels of these down so that your fish are always never stressed. These will also occur when first setting up your tank, for more information visit the cycling your aquarium page. In emergency situations Nitrites and Ammonia can be dealt with through small water changes done frequently. Use a water dechlorinate solution (often with a buffer to remove toxic ammonia) to neutralize the emergency situation. Continue water changes, remove any decaying matter and try to pinpoint the reason for the spike. 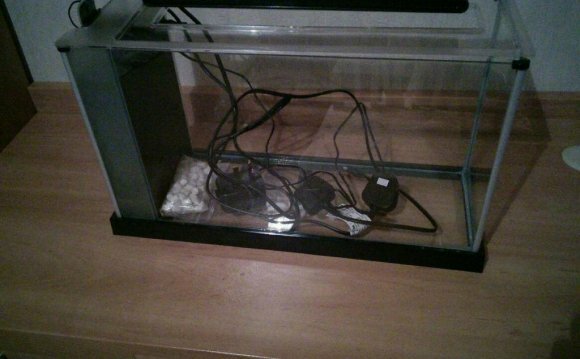 If possible it is sensible to move fish to another stable aquarium while levels drop and stabilize. Nitrates are not an immediate danger to your fish like ammonia and nitrite. However over time nitrates can accumulate within the aquarium and become toxic to the fish. If nitrate levels become extremely elevated (50ppm+) the fish in the aquarium may lose coloration, appetite general health. It is best to keep nitrates as close to 0ppm as possible. This can be done by having a densely planted aquarium. Plants uptake nitrogen, potassium and phosphorous in their diet. Fish excrement is composed of all these elements. This is a great way to make a mini-ecosystem that literally recycles micro elements within the aquarium, requiring less maintenance and adjustment. A tank with both a school of fish and a many plants will require less fertilizers due to the fish providing some fertilizer to the plants. Constant water changes need to be completed at least once a week. Doing so will reduce the accumulation of nitrates in the water and sustain a healthier environment to your fish. If nitrates are consistently at elevated levels, consider 2-3 water changes each week. KH is carbonate hardness and refers to how much carbonate is in the water. This becomes even more relevant when injecting CO2 into the aquarium. KH also provides a neat way to be able to estimate how much dissolved CO2 is in the aquarium at a point in time. Carbonate hardness also determines buffering capacity of the aquarium water. This is important in CO2 dosing in deciding how much of a pH swing there will be in the aquarium when the lights are switched off. Higher KH will mean an improved buffer capacity. Most aquarium fish species do not enjoy high carbonate hardness, around 80ppm + is desired to act as a good buffer and be tolerable for aquarium fish. A higher KH will also stop your pH slowly dropping over time. KH can simply be raised by using a small amount of sodium bicarbonate in the aquarium. This should also be completed when carrying out a water change. One ½ a teaspoon will raise the KH by about 2 degrees in 25 gallons of water. Scale this measure to your aquarium and add the required amount. A 55 gallon 3 foot aquarium will have an increase of just under 2 KH with the addition of one teaspoon of bicarbonate of soda (ensure it is not baking soda). If the KH needs to be continually boosted another way of raising it is to use a bag of crushed coral in the filter. Start with a small half fist sized bag and work your way up. Coral may also raise the pH so make sure to add small amounts to avoid pH swings.